This is one of those weekends - becoming more frequent, Deo gratias - where those with a traditional leaning are spoilt for choice. 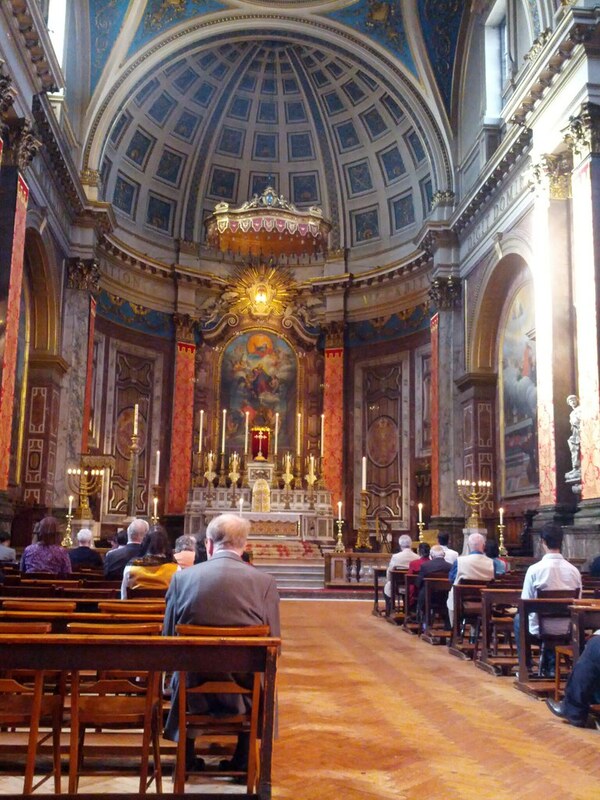 Cardinal Burke is visiting the London Oratory, and there are Ordinations for the Ordinariate at Westminster Cathedral (at which John Hunwicke is to be ordained deacon at long last!) There are a few other things happening as well - the Reluctant Sinner has more details on his blog. 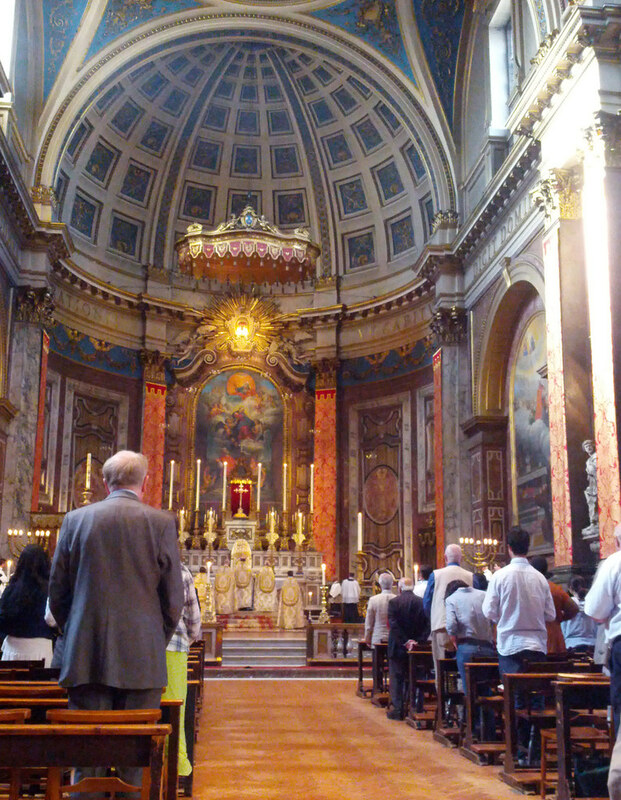 Having decided that I really couldn't spare the time on Saturday to trek up to London, I decided to make the supreme effort to attend Vespers at the Oratory this evening instead. 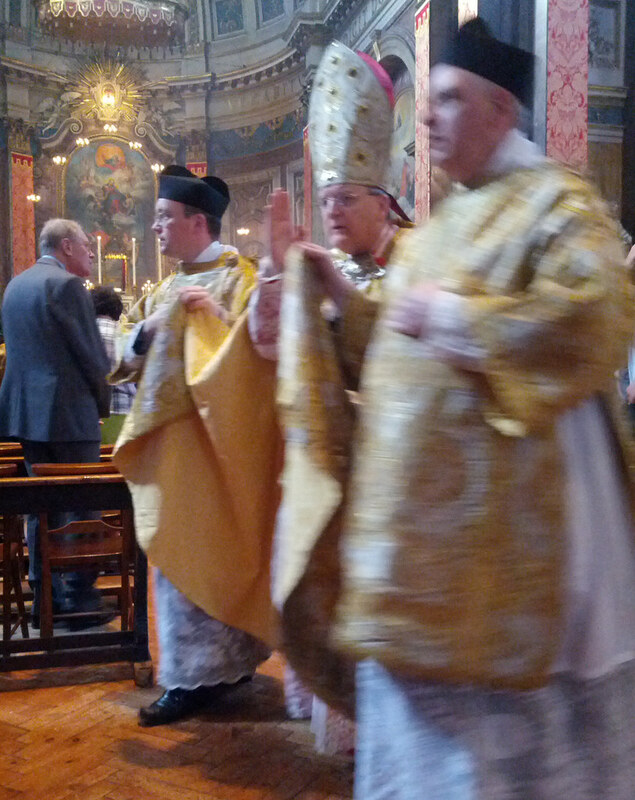 Cardinal Burke was to be there and there would be Pontifical Benediction after Vespers. After a very trying day I was tempted to head straight home, but resisted! I'm very glad that I did - it was rather wonderful. 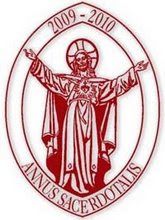 Five-Cope Vespers, no less, and a Cardinal at the Throne!! I even got there early enough to get permission to take photos - after promising that my camera was silent and I wouldn't use a flash... they were much more understanding than at Westminster Cathedral! I spotted a few familiar faces, though I'm sure several regulars are actually off on their way to Chartres. 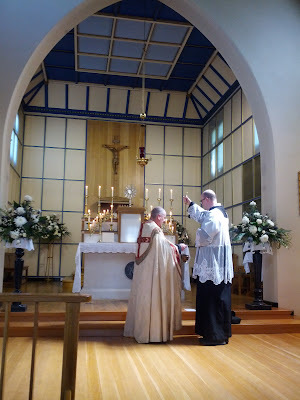 I nearly plucked up the courage to introduce myself to Fr. James Bradley, but he was deep in conversation and I thought I'd spare him the mad-Catholic-lady ordeal! I was planning to have a well-deserved and very rare "early night" curled up under the duvet with my kindle. I heard a loud commotion from the catflap, and realised that something large was being dragged in. 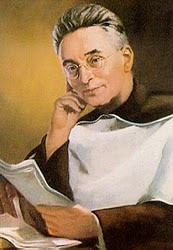 I was right - Monsignor Miaowrini had caught a pigeon which was almost as large as herself. 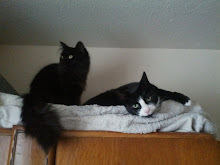 While hunting in the airing cupboard for a towel to throw over the pigeon, I saw Miaowrini's pigeon-handling technique in action. She's really rather good at it - sitting astride the bird, she grabbed its neck in her mouth and then "duck-walked" it into the living room. 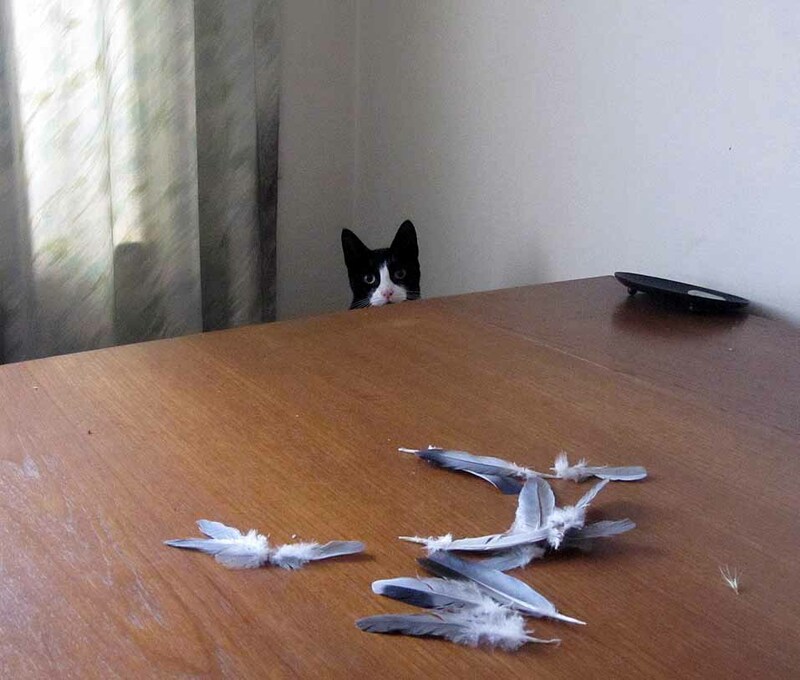 She then held it down with her paws and spat out a few feathers, presumably preparatory to taking a large chunk out of the bird. Sadly for Miaowrini, I had succeeded in finding a towel by this point, and used it to scoop the pigeon up out of harm's way. 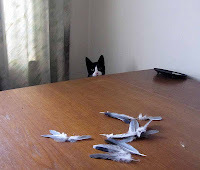 Miaowrini was still in the living room, literally spitting feathers, as I held the bird out of my bedroom window, and let it fly off. We've been free of wildlife for a while, and I had hoped that the hunting season for pigeons was over for this year (I assumed that it was the younger, more inexperienced birds which were being nabbed!) It seems that I was wrong. Watch this space for further developments! 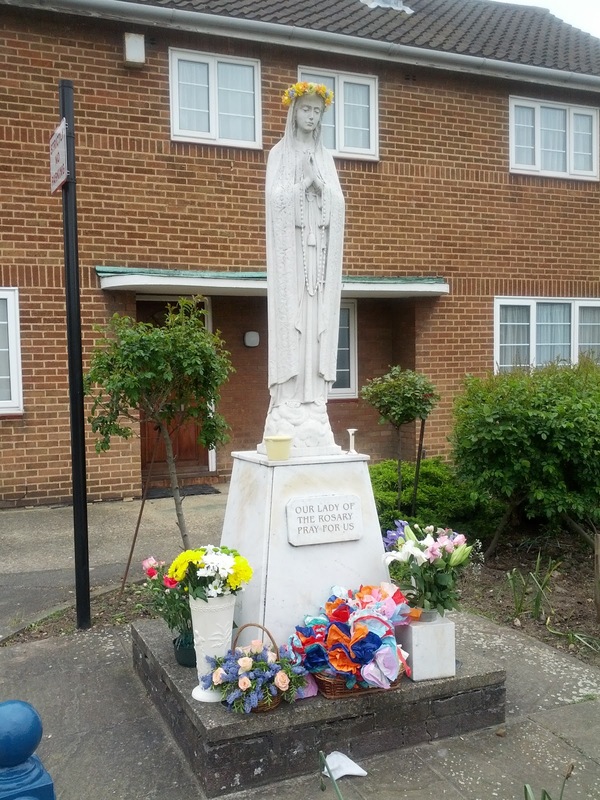 I was running a little late on Sunday morning, and didn't make it to church in time for the crowning of Our Lady's statue after the 9am Mass, though the floral crown did look rather good. Nevertheless, I wanted to get the picture up on the blog. Enjoy! Apologies to Dr Seuss! Annie Elizabeth very kindly presented me with a box of newly-laid eggs. 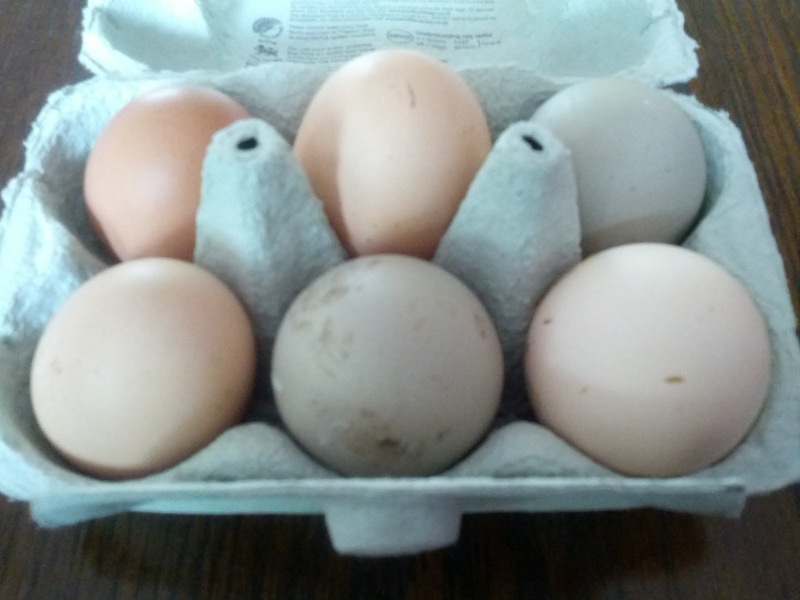 Her hens lay eggs of varying colours, the most unusual (in my limited experience) being a greyish green. 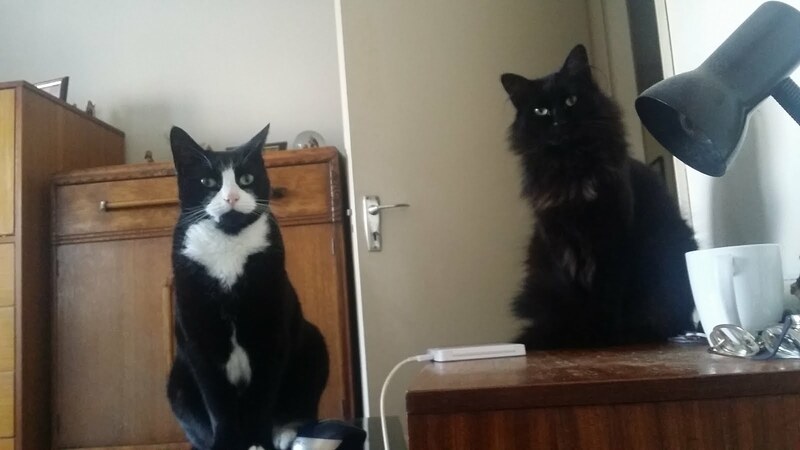 I am about to turn two of them into fried egg sandwiches, as I haven't yet had lunch. I meant to have lunch much earlier, but gave in to the temptation of watching the England v Windies match being shown in the parish club (with Zephyrinus and Greg providing commentary as to the fielding positions and the effects of weather on the number of men generally in the slips.) Then I had to go and get some of my rubbish delivered to the Re(f)use & Recycling Centre before it closed.